S Janaki got offers from the very beginning in Kannada industry.Irrespective of Music Director and the producer , she was part of several successful musicals .G K Venkatesh, Vijaya Bhaskar, Rajan- Nagendra, T.G.Lingappa, Upendrakumar, Hamsalekha are in one way representatives of kananda music for 70′,80′s and 90′s and S Janaki was the favorite of all .Music directors from tamil and telugu industry like Sathyam, Chakravarthy, Ilayaraja, Rameshnaidu, Shankra Ganesh chose her as their main singer when they did kananda movies. Even Vijayabhaskar, whose main singers were P Susheela in 60′s and Vanijayaram in 70′s and 80′s gave some remarkable songs to Janaki in movies like Gejje pooje which left an everlasting impression on her singing skills.She got to sing some extra ordinary Solos and beautiful duets with PBS, Rajkumar , SPB and KJY. She enjoyed maximum success of her career in Kannada itslef. It is never an easy task to start describing some 1000′s of songs sung by her.Let us go round a Melodious trip of career right from her starting days to the days where she reigned the Kannada music. Playback singing started in Kannada film Industry after 1950s. Till then the actors and the actresses were singing themselves. Even though Kannada film industry had their own talent from the theater, the talents from Tamil and Telugu industry started flowing into Kannada film industry. Among them Ghantasala, PB Srinivas, P Susheela, C.S. Jayaraman, AM Raja, P Leela, AP Komala, Soola mangalam Rajalakshmi were prominent .During this time ,new actors and actresses were introduced to the Kannada film Induustry. New Musicians added new dimensions to kannada Music. If we look at the 50 years of Kannada music right from 1950 , One of the most prominent names in them is S JANAKI .She was a child prodegy and started singing at the tender age of 3. She had an immense talent at the very young age to imitate any thing that she saw and listened to. Even though she could not learn classical music, the concentration and the eagerness to learn had made her climb the peak in music. She was also blessed by Gana Swarswathi. By her rich melodious voice she made a permanent place in hearts of millions of kannadiga’s for ever. Song was also pathos. Pendyala Nageswara Rao who made her sing the very first song of her career in telugu introduced in Kannada too . It was a duet song “Bhale Bhale Garudi” in Sri Krishna garudi and it turned out to be a big hit.By this she stamped her arrival in Kannada industry in the year 1958. Since then she has never turned back. At that time this was great gift to the Kannada film industry. It was not a path of flowers for her . There were veterens like P Leela, AP Komala and P Susheela who gained lots of popularity and made a standard impression as voice of Heroines in the hearts of Kannada Music Lovers. But this budding singer left her own impression .She got some good songs during 50′s and 60′s especially duets with P B Srinivas gave her a good recognition. Her Solos sequences were equally good and memorable during this period. 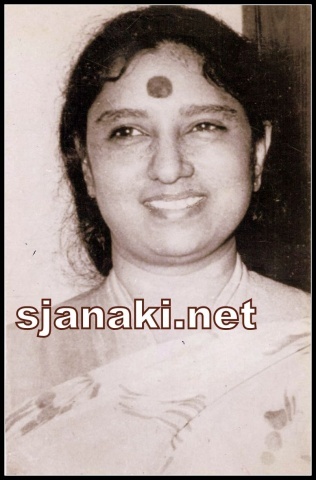 S Janaki was very fortunate to have the opportunity to work with rare music Directors during the period 1950 to 1960. The first amongst them was R Divakar. He was the music director for the film ‘Rayara Sose” produced by Smt Pandari Bai in the year 1957. The next music composition by him was in the year 1974 for the film “Hema Reddy Mallamma”. The melodious song “Ondu Magu Itthu Adu Ninna Holuthithu” was very popular. In 1959 she sung a melodious song “Hrudaya Deviye Ninna” with Dr PB Srinivas under the music direction of P Kalinga Rao for the film “Abba AA Hudugi”. Similarly the film “Asha Sundari” released in 1960 which had music by Dakshina Murthy. The song “Amruthamayavee Sneha” with P Susheela in that movie is very popular. M. Venkata Raju revolutionized Kannada industry in a way by making PBS the standard voice of Dr.Rajkumar. Movie Bhaktha Kanadasa was PBS all the way with his wornderful singing . In that movie , S Janaki got to sing an excellent melody “Shrungara sheela Sangeetha Lola” with very few but interesting lines by P B Sreenivas. This song is a radio favorite and is very popular even today after 50 years !!! In the Same movie , she a beautiful solo “Iralu Ellellu KariruLu” which was a bit hit. He gave her quite interesting devotionals like “Omkara Rupiniye Kalyani” from the movie “Raja Satyavrata” in 1961 and “Jaya Gowri Jagadeeshwari” from the movie “Swarna Gowri” (1962) . With her melodious singing she has given a special dimension to these songs. Two other songs from the same movie “Baara Chandrama” duet with PBS and “Hadalenu Manadase Nanu” pathos are also beautiful ones. Stay tuned for Mooooooooore Updates !!!!!!! !